PCCs are charities, and their members are Charity Trustees (see our page on trusteeship). In this section, we offer some resources to help PCCs and their members. Working with the legal and safeguarding teams, we've produced a handy Checklist to help you ensure you're on top of most of the key aspects of good governance and compliance. Completing this could be done together as a PCC to build awareness of what is required, or led by one of the officers building input from others as necessary. It's a good idea to review this once a year as the requirements facing charities change over time. The General Data Protection Regulation (GDPR) will take effect in the UK from 25 May 2018. Parishes must comply with its requirements, just like any other charity or organisation. 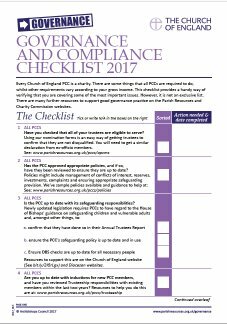 We've lots of guidance, templates and a checklist to help parishes implement this. Click here for the forms you need to revise your electoral roll and run the parish's annual parochial church meeting. Click here for a monthly Parish Parochial Church meetings notice template. Please note the inclusion of the agenda on this document is optional. Those PCCs with annual incomes over £100,000 are required by law to register with the Charity Commission. Click here for full guidance on the process for registering your PCC if your income is above this threshold. For registered PCCs, we also offer guidance on when you should show your registered status. Registered charities will also need to report serious incidents to the Charity Commission. Click here to find out more about the documents which set out governance arrangements for PCCs. You will need certain policies to ensure that you have the processes in place to manage potential issues, and that you’ve agreed as a Council how you will do this. The policies that you will need will depend on your situation, but guidance to help you with some of the common ones is available here. We have produced a "Good Practice" guide to developing Reserves Policies. There is also a guide to Managing Restricted Funds, and how parishes can manage these effectively. Click here to see guidance on managing risks - with checklists and examples. Click here to see our page of FAQs about PCCs as Charities.